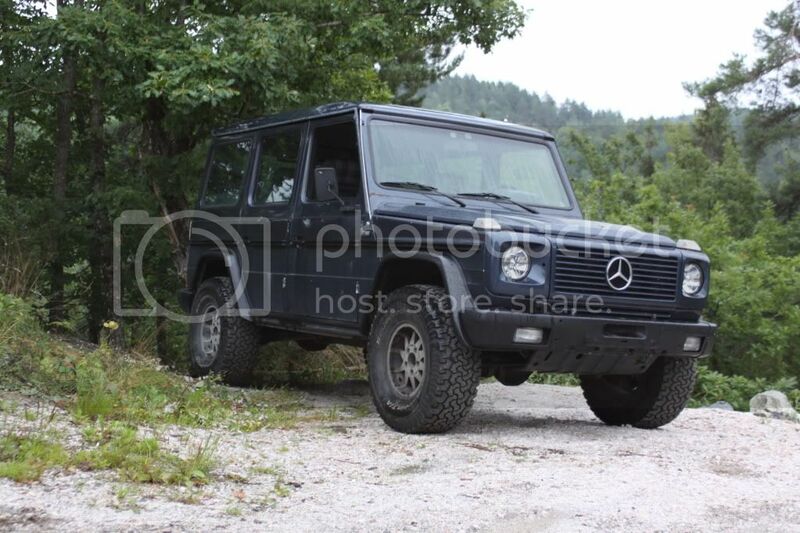 Ideal Tire Size for a G-wagon? Wondering what the ideal tire size is for a G-wagon without a lift. 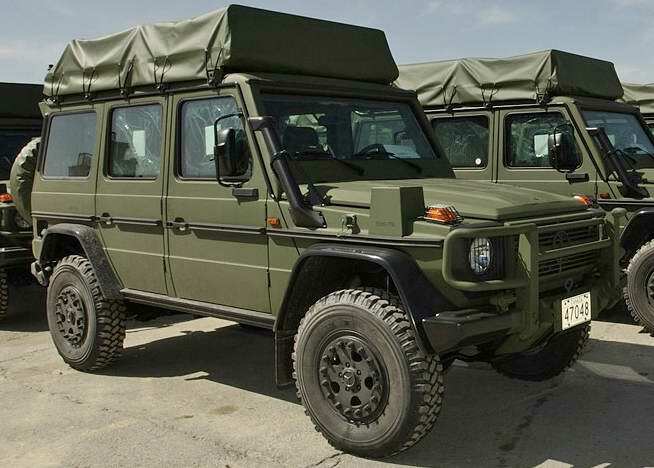 I haven't had much experience with G-wagons, but I had someone asking me about it today so I thought I would go to the experts. Its going to be a on a 17" rim. KM2 are the desired tire right now but it will all depend on size. After researching it a bit more it looks as though the stock tire size is about 30.5" or so (on the 09' models). BFG makes a few different sized in the KM2 that are equal in size and slightly larger when using a 17" rim. the 2 larger tires are a 285/70R17 ~ 33" x 11ish , and a 305/65R17 ~ 33 x 12ish "
Next from that is 35", which i assume is out of the question with the stock suspension height. The G-wagon is obviously rare and unique vehicle. but are the wheel wells such that you can squeeze some nice sized tires without a lift? From a glance it seams like there is quite a bit of room to fit more but then again I've seen SUV's that rub with a size increase of 1". First question is what year is the G you are helping fit tires? There are several good sites that have specs and info - try http://www.4x4abc.com/. If you don't find what you need, give more specifics. I think the g-wagon folk here said once that 35" was the biggest one could put on. I'm guessing that is with a lift, as you said there is not a lot of room in the wells (still looks like it will rub from the one I saw with 35's). I'd still like to wheel with one and check it out. I use 235-85x16 Yokohama Geolandar AT-S and they work out very good even in severe off road conditions. Anything bigger and the suspension and engine will pay the price. Thanks everyone, I'll keep you posted if we end up installing them. I think the Canadian mil spec ones use 8.25R16 which is about 34"... factory installed. if thats the case the 33's should fit. The rims we're going to be installing are almost identical to the ones in the picture. I wonder if there made by the same company? 33" is the biggest you want to go for. And even with 33" and no lift, you probably need to grind down slightly on the 75 mm (3 inch) tube, sticking out behind the front wheels. This is to avoid rubbing at this point. This does depend on width, backspacing and offset. I run 4,88 gears, 40 mm lift and 33 x 12,5 15 on my 460. No need for cutting with 40 mm lift. G force - How was you power and braking loss with the 33s? Liveable? This is the size I'm thinking of, after dismissing 35s (don't want to regear, and I'm not doing much stuff like Rubicon anymore, so don't need huge tires). Thanks! No problem regarding braking ability. But you can feel the difference between 31" and 33". But you only adjust your way of pushing the pedal. Slightly harder to begin with. The engine power on G diesel are never enough, and even worse with bigger tires. The standard 3 liter 88 hp, is at its best, very slow on 33`s. My newest wagon have the turbo version, and with small adjustments, its closer to a normal car. A couple of guys in Finland, managed to pull 335 hp from this engine, with an adjusted diesel pump, and a slightly larger turbo. I know that would be adequate!! And it actually works for more than a few weeks!! As ive been out shopping for another G, i can now say that 33" will fit on standard height. Slightly limited stering ability, but other than that, its ok. And it looks cool!! On 33`s with standard suspension.